Every guitarist knows that one of most enjoyable things about playing the guitar is it's a fun, lovable, on-the-go, social instrument! 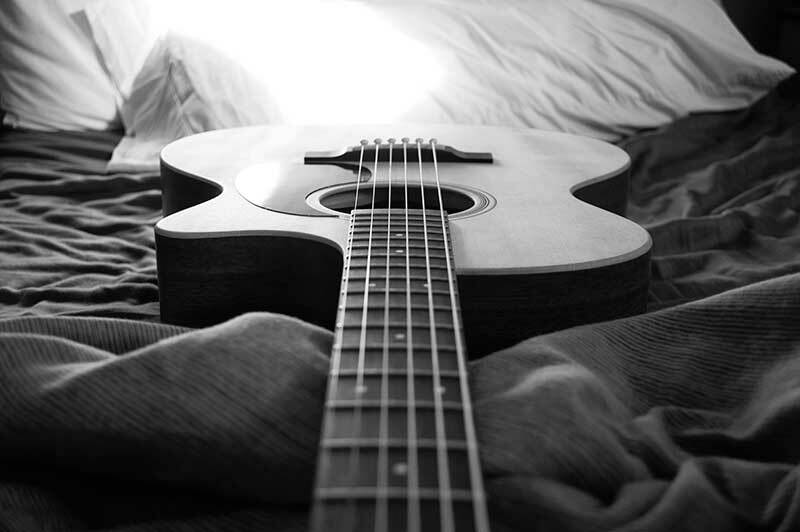 You, your guitar, plus a few memorized songs can become the life of the party! However, when you are in the comfort of your home, or at the music studio, you may prefer to have an environment that is best suited to your practicing needs, which is why we'll help you find the best guitar chair for you. We understand that a guitar chair is probably not the first item on your guitar to-buy list, but it certainly can add to the comfort of your practicing sessions! The right guitar chair can also help you with back and leg support, and even add a personal touch or flair to your studio space or corner. We have looked at some of the best guitar chairs and would like to recommend our top five favorite guitar chairs! The Odyessy DJ Chair is a lovely, sleek black guitar chair that features a removable padded top that is circular in design and 12 inches in diameter. It is height adjustable from 19 to 33 inches and was designed in particular to relieve back and leg stress while playing the guitar. This strikingly comfortable chair aims to satisfy your comfort and portability needs with portable seating, a foldable back leg, elegant padding, and adjustability. Is your budget a little higher? Are you looking for a slightly higher-quality product? If so, you may want to consider the Quik Lok DX749. The Quik Lok DX749 is one of our favorite chairs due to its highly adjustable footrest and back. More adjustable than the Odyessy, the Quik Lok is a sturdy chair weighing 27.56 pounds, making it slightly less portable, and more ideal for a stationary studio chair. Despite being a slightly heavy chair, customers state that it is easily foldable and collapses into small spaces. This luxury black guitar chair measures 7.68 x 39.96 x 16.54 in and comes from Italy. It can be shipped to the US and or to APO/FOP addresses only. The Quik Lok is highly comfortable and features a high backrest that customers love with a slightly higher price tag than other chairs. The chair, however, does not lock into a stable position when moving or transporting it. Although it is not ideal for portability, it is a very reliable sturdy chair for long hours of practice. If you are looking for a more portable and affordable chair check out the Pyle PKST70. The Pyle PKST70 is an excellent sturdy chair for musicians for a more than reasonable price. The Pyle PKST70 hits our top 5 list for its foldable design, adjustability, and durable construction. The Pyle PKST70’s padded seat and backrest provide hours of comfortable playing for any level guitarist. This chair also features a quality adjustable footrest, which may assist you while practicing and is also height adjustable. It weighs 21.7 pounds, and the seat measures 17 x 12 inches, making it a large, sturdy chair. Additionally, the Pyle was designed to be portable despite its weight and size. The footrest, seat, and back all fold to make it easy to move and store. This chair is perfect for the guitarist who wants to play an hour a day and is looking for a solid chair at a reasonable price. The Yamaha PKBB1 is a simply designed, affordable musician stool ideal for any pianist, guitarist, or drummer. The PKBB1 features a comfortable padded seat and has three different height adjustments that allow you to make small moderations to the height (17.5 -19.5 inches). This chair is ideal for guitarists who are searching for a small, foldable, portable, and yet also comfortable chair. It was not designed, however, with long hours of performing or practicing in mind for any instrument, as it does not have a backrest or footrest. The PKBB1 was designed for use with a keyboard, but it great for guitarists due to its thick padding. At an incredibly affordable price you can't beat this musician’s bench! Looking for a fun and funky guitar stool for your home studio or garage band gang? Try the Fender 24-inch stool! The Fender 24-inch custom shop pinstripe guitar stool is a sweet find for your home studio! Featuring a classic style and the brand name Fender, this guitar stool is the perfect addition to your music space or guitar room. It is made from heavy gauge 1-inch steel tubing, which makes it a very reliable, sturdy stool, that guitarists love! You cannot go wrong with this guitar stool if you are looking for a combination of style, comfort, and affordability. Customers love the Fender stool when looking for a casual guitar stool, but report that it is not a stool that you can use for several hours of practice because it is not thickly padded. This fun brand name stool is great for the basement or garage band, but it is not, however, a professional grade stool. Next articleWhy Buy a Vocal Harmonizer?